Pemphigoid is derived from Greek word and it means a form of blister. Bullous pemphigoid (BP) is a rare autoimmune blistering disease (AIBD) usually affecting the elderly people. The epidemiology of BP estimated to be 0.2 and 3 per 100,000 people per year. Among autoimmune vesiculobullous lesion, pemphigus vulgaris is more common than BP in India. A regional study in UK estimated an incidence of 1.4 per 100,000 people per year. The mechanism behind bullae formation are IgG autoantibodies bind to the basement membrane, which activates complement and inflammatory mediators. Activation of the complement system is thought to play a critical role in attracting inflammatory cells to the basement membrane zone, thereby releasing proteases, which degrade hemidesmosomal proteins leading to blister formation. Dermoepidermal cohesion is promoted by two components of adhesion complexes, namely, 180- and 230–KD antigen. In BP, sub epidermal autoantibodies are directed against these antigens promoting loss of cell adhesion. DIF is found to be the gold standard test for differentiating among vesiculobullous lesions particularly in case of BP. A 45-year-old female patient named Thenmozhi came to Ragas Dental College Outpatient Department with a chief complaint of soreness in the upper and lower gum regions for past 2 years and history of itching in palms and feet since 2 weeks, after which she started developing multiple bullae inside the mouth and rupture of bullae leaving an ulcer. During masticating hard food items and sometimes even after forceful brushing, the incidence of bullae is provoked, which resolved within 2–3 days. 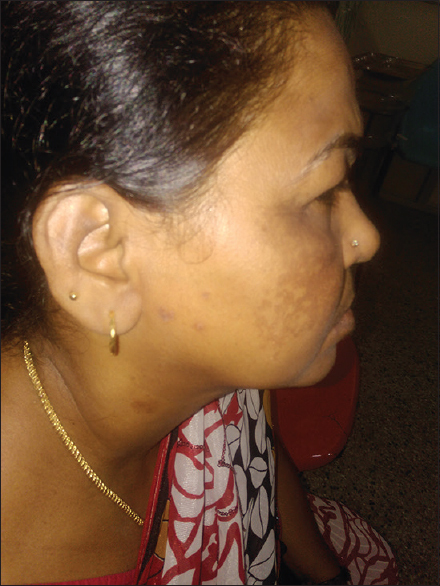 She had a history of pruritus followed by appearance of extraoral bullae and on rupture leaving discoloration in left side of the cheek and neck regions for past 3 days. She underwent scaling and restoration before 1 year. On extra oral examination, pruritic macule [Figure 1] on the left side cheek and neck regions was noted. Diffuse rash is noted over the left- and right-side zygoma, crossing over the bridge of nose. On intraoral soft tissue examination, gingiva appeared generalized erythematous, desquamative, ulcerated, sloughing epithelial surface [Figure 2] with loss of stippling and scalloping, blunt interdental papilla, soft and edematous in consistency, generalized bleeding on probing. 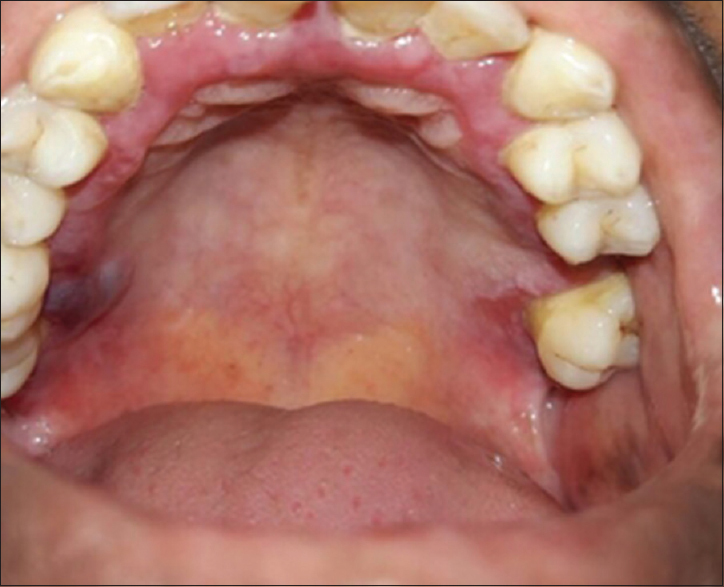 On inspection of palatal mucosa, desquamation, ulceration in relation to 28 of ~1 cm in size with irregular margin [Figure 3] and a smooth, solitary bullae, with purplish hue in relation to 17,18 [Figure 4] of ~1 2 cm extending anteriorly from mesial interdental margin of 17 to distal margin of 18 posteriorly and superoinferiorly 1 cm from cervical margin of 17,18 with diffuse margin is noted. On palpation, it was tender, soft in consistency, and no bleeding tendency was evident. Diseases of the pemphigus group can be easily differentiated by distinctive clinical features. Mucous membrane pemphigoid can be differentiated from BP by its predominant involvement of mucosal surfaces and positive Nikolsky's sign. Lichen planus pemphigoides is clinically differentiated by the presence of lichen planus lesions in addition to tense blisters. 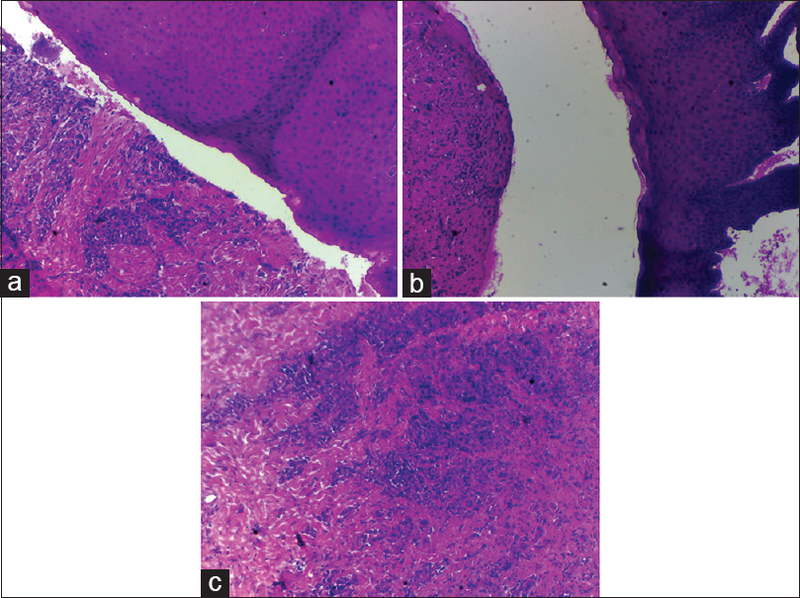 Biopsy was performed perilesional within 1 cm over the intact bullae in relation to palatal aspect of 17,18 [Figure 4] under aseptic condition, and the biopsy sample was sent simultaneously for both histopathological analysis and direct immunofluorescence study. Histopathological report revealed hyperparakeratinized stratified squamous epithelium with underlying connective tissue stroma. Subepithelial split [Figure 5]a and [Figure 5]b is noticed. The connective tissue is densely collagenized with moderate cellularity. The mucosa is acanthotic with some neutrophilic exocytosis. Diffuse moderate chronic inflammatory cell infiltrate is noticed. Vascularity appears to be minimal. 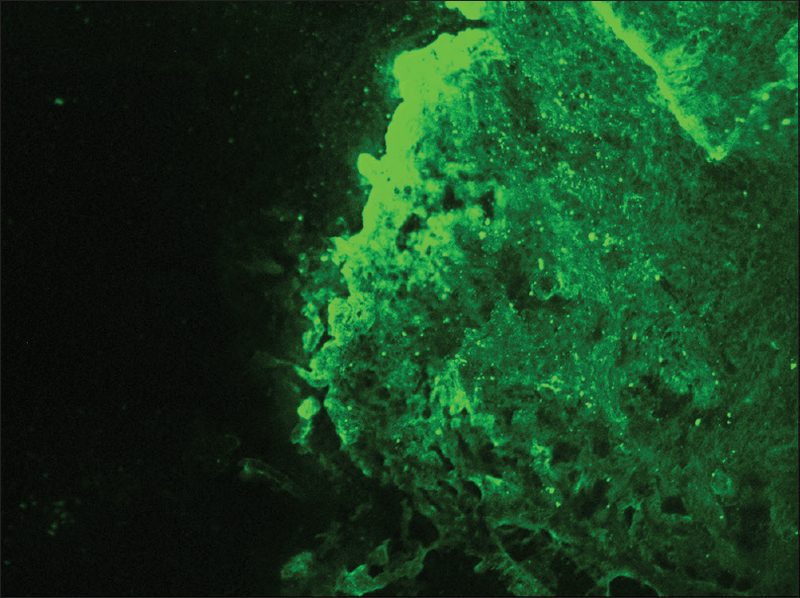 Direct immunofluorescence findings revealed evidence of linear deposition of IgG [Figure 6], C3[Figure 7], and fibrinogen [Figure 8] along the dermal–epidermal junction (basement membrane zone). Thus, the conclusive diagnosis of BP was arrived on the basis of history, clinical presentation, and immunological findings. She was managed with systemic steroids, prednisolone (Omnocortil) – 10 mg initially twice daily for 3 days and once daily for 6 days – and the dosage was reduced to half for about 15 days. Predinosolone being an intermediate acting steroid is given daily in the morning in a single dose of 1 mg/kg/body weight. This is to mimic the pattern of suprarenal secretion (circadian rhythm), thereby duration of hypothalomo hypophyseal axis was suppressed. Upon review the incidence of bullae has been reduced followed by which drug was tapered and put under maintenance therapy. BP is an autoimmune vesiculobullous disease usually affecting the elderly people; its incidence increases with age. In our study the affected individual is an elderly one. It is usually presented with rare oral manifestations sparing the buccal mucosa, palate, and gingivae. Oral involvement is seen prior to skin manifestations with the commonly affected site being palate. Palate is the most commonly affected site in our case. 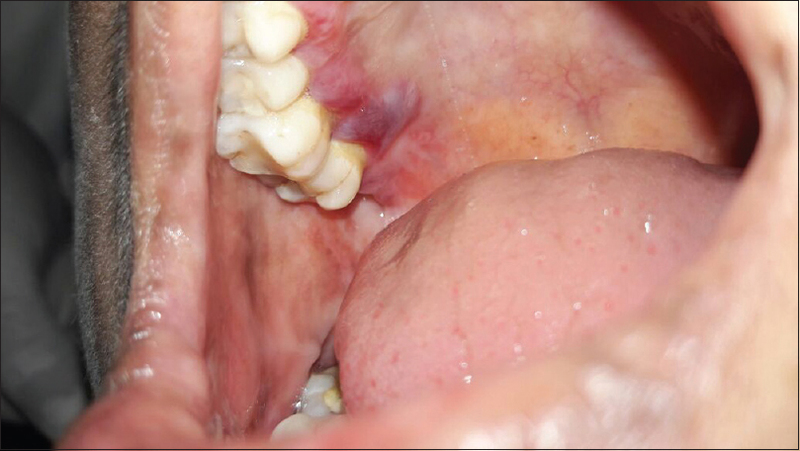 Oral lesions comprise of bullae/vesicle that rupture to form erosions and ultimately leave out ulcerations. Her history revealed onset of bullae followed by rupture and leaving out painful ulcerations. 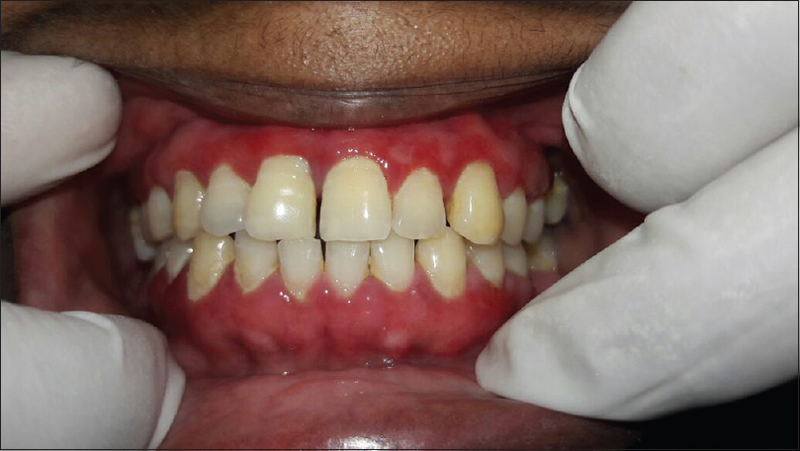 Clinical presentation of chronic desquamative gingivitis was evident in our case. Severe itching and blister formation are the most commonly encountered symptoms in patients. Similarly, in our case, she had a history of itching in palms and feet before the development of bullae inside the mouth. Pruritus can be the common clinical presentation, which may persist for several weeks or months, although scarring is not seen, leaving out only pigmentation in the normal skin background. She had pruritic macule on the left side and a history of extraoral bullae followed by rupture and leaving out discoloration in the affected area. The Nikolsky's sign was found to be negative. Nikolsky's sign is present in case of pemphigus and cicatricial pemphigoid, but not in the case of BP. In our case also, Nikolsky's sign was negative. Mucous membrane pemphigoid can be differentiated from BP by its predominant involvement of mucosal surfaces. Apart from evaluating history, clinical presentation, histopathological analysis is carried out followed by direct immunofluorescence study for the differential diagnosis and confirmation of the condition. Direct immunofluorescence is found to be the gold standard test. Deposition pattern of different types of immunoreactants differentiates the various immune-mediated diseases. 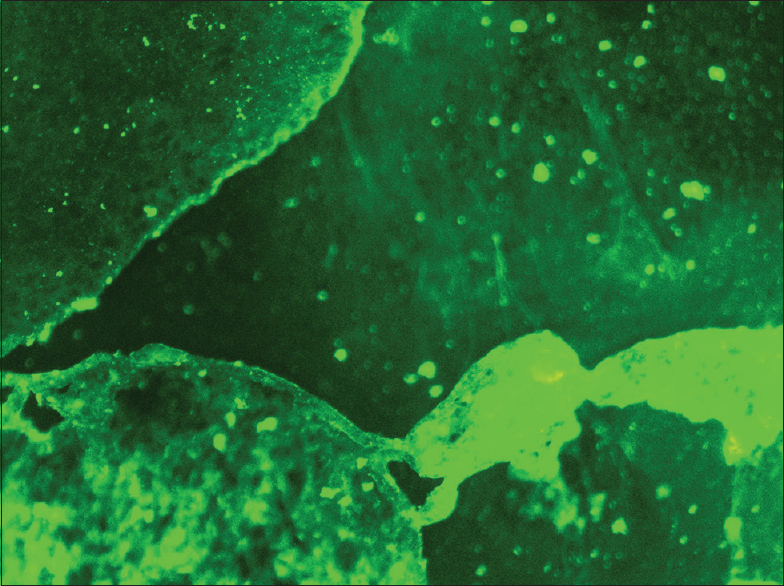 Direct immunofluorescence shows presence of IgG and C3 deposits along the basement membrane zone Histopathological report reveal subepithelial split with some neutrophilic exocytosis. 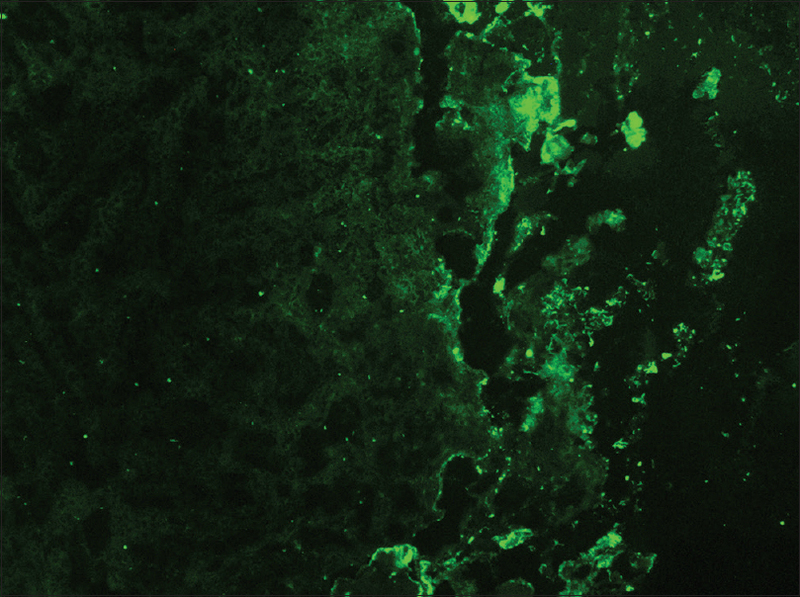 Our case also revealed same subepithelial split and direct immunofluorescence findings. Thus, the conclusive diagnosis of BP was arrived on the basis of history, clinical presentation, and immunological findings. Treatment is based on the degree of cutaneous and oral involvement. Mostly, topical steroid (clobetasol propionate) gives satisfactory result in case of smaller area of skin involvement, whereas larger area of skin involvement and recurrent cases are treated satisfactorily with systemic steroids and immunosuppressive agents. The relapse rate of BP ranges from 27.87% to 53% after disease remission, while the majority of relapses occur early (within 6 months) during remission. Recommended dosage for oral prednisolone is 0.3–1.25 mg/kg body weight/day, controls disease within 1–2 weeks, followed by which the dose is tapered. Dexamethasone (100 mg in 500 mL 5% dextrose i.v. over 2–3 h for three consecutive days) is the preferred steroid for pulse therapy, either administered alone or in combination with cyclophosphamide. Higher doses of systemic corticosteroids seem to be associated with higher mortality rates, which led to the addition of corticosteroid-sparing agents to the treatment of BP. The most frequently used immunosuppressive agent is azathioprine (0.5–2.5 mg/kg body weight/day). Others being cyclophosphamide, methotrexate, cyclosporine A, combination tetracycline/minocycline along with nicotinamide, and more recently, mycophenolate mofetil, a DNA synthesis inhibitor, and methotrexate, a folate antagonist. Other drugs for treating BP include new antibody modulators, rituximab 375mg/m2 weekly over 4 weeks and omalizumab subcutaneously 300–375 mg for every 6 weeks. IVIg – A dose of 1–2 g/kg for five consecutive day cycle of 0.4 g/kg/day, although a 3-day cycle may be used in cases that are nonresponsive to conventional therapy. In our case, she was managed with systemic steroids, and upon review, the incidence of bullae has been reduced followed by which drug was tapered and put under maintenance therapy. Vesiculobullous disorders although rare in occurrence, poses a severe life-threatening changes as it is very difficult to diagnose at the early stage based on the clinical pictures alone, requiring various diagnostic modality to derive at the definitive diagnosis. Treatment modality comprises of interdisciplinary approach among dentists, general physician, dermatologists, and ophthalmologists to successfully manage the patient with AIBD. Langan SM, Smeeth L, Hubbard R, Fleming KM, Smith CJ, West J. Bullous pemphigoid and pemphigus vulgaris - incidence and mortality in the UK: Population based cohort study. BMJ 2008;337:a180. Labib RS, Anhalt GJ, Patel HP, Mutasim DF, Diaz LA. Molecular heterogeneity of the bullous pemphigoid antigens as detected by immunoblotting. J Immunol 1986;136:1231-5. Lebe B, Niflioglu GG, Seyrek S, Ellidokuz H. Evaluation of clinical and histopathologic/direct immunofluorescence diagnosis in autoimmune vesiculobullous dermatitis: Utility of direct immunofluorescence. Turk J Pathol 2012;28:11-6. Sangavi J, Aditya A. Applications of corticosteroids in dentistry. J Dent Allied Sci 2015:4:19-24. Jung M, Kippes W, Messer G, Zillikens D, Rzany B. Increased risk of bullous pemphigoid in male and very old patients: A population-based study on incidence. J Am Acad Dermatol 1999;41:266-8. Chainani-Wu N, Lozada-Nur F. Oral Manifestations of Autoimmune Blistering Diseases. Available from: www.emedicine.com/derm/TOPIC661.HTM. [Last updated on 2016 Oct 03]. Raj PR, Rawther NN, James J, Sreedhar J. Bullous pemphigoid of the oral cavity -2 case reports with review of literature. IOSR J Dent Med Sci (IOSR-JDMS) 2015;111-4. Rosenbach MA, Writer Karolyn A. Wanat, Writer Cassio Lynm, Bullous pemphigoid. JAMA Dermatol 2013;149:382. Schmidt E, Borradori L. Clinical features and practical diagnosis of bullous pemphigoid. Immunol Allergy Clin N Am 2012;32:217-32. Mysorekar VV, Sumathy TK, Prasad ALS. Role of direct immunofluorescence in dermatological disorders. Indian Dermatol Online J 2015;6:172-80. Joly P, Roujeau JC, Benichou J, Picard C, Dreno B, Delaporte E, et al. A comparison of oral and topical corticosteroids in patients with bullous pemphigoid. N Engl J Med 2002;346:321-7. Wang Y, Mao X, Wang Y, Zeng Y, Liu Y, Jin H, et al. Relapse of bullous pemphigoid: An update on this stubborn clinical problem. J Ann Med 2018;50:234-9. Kirtschig G, Middleton P, Bennett C, Murrell DF, Wojnarowska F, Khumalo NP. Interventions for bullous pemphigoid. Cochrane Database Syst Rev 2010:CD002292. doi: 10.1002/14651858.CD002292.pub3. Sacchidanand S, Hiremath NC, Natraj HV, Revathi TN, Rani S, Pradeep G, et al. Dexamethasone-cyclophosphamide pulse therapy for autoimmune-vesiculobullous disorders at Victoria hospital, Bangalore. Dermatol Online J 2003;9:2. Beissert S, Werfel T, Frielin U. A comparison of oral methylprednisolone plus azathioprine or mycophenolate mofetil for the treatment of bullous pemphigoid. Arch Dermatol 2007;143:1536-42. Cho YT, Chu CY, Wang LF. First-line combination therapy with rituximab and corticosteroids provides a high complete remission rate in moderate-to-severe bullous pemphigoid. Br J Dermatol 2015;173:302-4. Yu KK, Crew AB, Messingham KA, Fairley JA, Woodley DT. Omalizumab therapy for bullous pemphigoid. J Am Acad Dermatol 2014;71:468-74. Ahmed AR. Intravenous immunoglobulin therapy for patients with bullous pemphigoid unresponsive to conventional immunosuppressive treatment. J Am Acad Dermatol 2001;45:825-35.